IMAGINE downtown Petaluma, circa 1879. The giant granaries rise into the sky, the clock tower perches high atop the stone edifice of the Masonic Lodge building, the canals and waterways bustle with the merry traffic of barges full of produce and gondolas ridden by singing Mexican "vaqueros de agua," as crates of pickled eggs lie waiting for their passage to the Russian gold fields up north. Or conjure up a picture of Bodega Head as it once was, the ancient Spanish garrison sprawled at the ocean's side, a mere 18 miles from the Spanish-Russian border. To the right of the lighthouse, the distinctive onion-shaped domes of the new Russian Orthodox Cathedral can be seen faintly gleaming across the peaceful green-blue waters of the bay. Assorted groups of prosperous Indians, Russians, and Mexican soldiers swap tales and songs while one or two Yankee peasants stand around begging for handouts. Don't worry if these 120-year-old images don't ring any bells. You didn't read about any of them in the local history books, because, of course, the true past of Sonoma County was nothing like this. Such visions exist only in the fantastical paintings and "alternative histories" of west county artist and writer Patrick Fanning. In an ambitious project begun last year, Fanning--whose remarkable works will be on display for the first time during the upcoming Art at the Source open-studio tour on June 5 and 6 (see sidebar, next page)--has reimagined the history of Northern California, inventing a past in which the Indians were saved from annihilation, the Russians never left Fort Ross, and Mexico, having never ceded California to the American colonies, established a glorious artistic-industrial utopia along the rich, culturally vibrant Russian border. Fanning, one of the organizers of the upcoming open-studio event, is also the founder of the Oakland-based New Harbinger Publications, a 25-year-old publishing firm dedicated to self-help psychology books. Now almost retired--the 52-year-old publisher still travels to Oakland once a week from his Graton home to keep tabs on things--he has devoted his spare time to painting. "I dabbled in art back in college, but dropped it when I started my company," he explains. "Now that I'm semi-retired, I've given myself over to it again. I guess you could say I'm retreading myself as a painter. For the last five years, painting has been my passion." This artistic resurrection took place, dramatically enough, in Italy, where Fanning was vacationing with his family. "On a whim, I brought along a sketchpad and a box of watercolors," he recalls. "On my travels I ran into some reproductions of work by John Singer Sargent's 'Venice Paintings.' They knocked me out. Immediately, I started painting again." "But I discovered in Italy that, on the side, he'd also done a lot of landscape paintings, watercolors and oils that he'd done in incredible places all over the world," Fanning explains. "He had a loose, impressionistic style that I was drawn to." Upon his return to California, Fanning organized what he calls "the Monday Morning Painters," a group of 120 Sonoma County artists. Once a week, a few dozen or so of the artists show up, easels and paint-boxes in tow, at prearranged sites throughout the county. "We go to the beach, to the wineries, a lot of good spots for painting landscapes," Fanning says. "By now, of course, I've painted a lot of these places many times. So I was looking for a way to reinterpret the landscape." Around that time, his son was given a copy of James Gurney's Dinotopia, a sensation-causing book in which Gurney--a renowned painter for National Geographic who specializes in the speculative visual reconstruction of long-vanished civilizations--presented a world in which dinosaurs and people lived in a mutually enriching coexistence. "I always thought that was a neat idea," Fanning enthuses, "and I thought I'd like to try peopling the Sonoma County landscape with something fantastic, but I didn't know what. I was quite certain I didn't want dinosaurs." Eventually he arrived at an equally fantastic notion: utopia. "I was out painting at Fort Ross," he says, "and I realized, suddenly, that it could have conceivably turned out that California was part Russian and part Mexican, and that our area, right down the middle of Sonoma County, would have been a really dynamic border area if that had happened. "And I was thinking how nice Bodega Bay would look if all the tacky stucco and junky buildings were gone, and instead all the architecture were done with adobe and tiled roofs. I knew I wanted to paint that, if for no other reason than so I could see what it would look like." 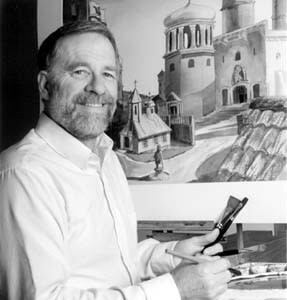 RECALLING his encounter with the work of Sargent, and knowing that he'd need a "historical" framework for his make-believe history, Fanning developed a fictional time-line, and arrived at the notion of a young John Singer Sargent bumping into an itinerant Mark Twain while traveling in Alta California. In Fanning's scenario, the artist then attempted to paint a chronicle of his sojourn in that strange land. While the artist side of Fanning began to tackle the visual aspects of the project--trying to see the world as Sargent might have seen it--the writer in him began composing a kind of correspondence, alternating colorful newspaper dispatches by Mark Twain with personal diary entries by Sargent. The result is definitely remarkable. There's a unique thrill in seeing those Mexican gondoliers in Fanning's painting of a Venice-like "Rio Petaluma," or that fairy-tale stone bridge over the Russian River, on which a blessing ceremony is being performed by a trio of dignitaries: a Russian Orthodox priest, a Miwok princess, and the pope--a politically "born again" Junipero Serra, the progressive leader of the newly formed Western Church, a renegade splinter from the harsh Roman papacy. "It's all pretty strange," Fanning admits, with a laugh. "But it's strange in a satisfying way." After completing half a dozen paintings and numerous sketches of this alternate reality, Fanning has come to the following conclusion. "It ain't as easy as James Gurney makes it look," he exclaims. As for attempting to emulate Sargent, he admits, "I'm not as good a painter as Sargent. But that's OK. I'm not as good a writer as Mark Twain, either. "But it's been fun to try," Fanning adds, "and hey, I'm getting a great education." From the May 27-June 2, 1999 issue of the Sonoma County Independent.